Dramatic foliage and colorful fruits (white, green and other colors in addition to the usual deep purple) make this heat-loving annual a good choice for ornamental beds as well as vegetable gardens. Needs two or more months with night-time temperatures near 70 F for good fruit production. Test. Prefers fertile, well-drained, slightly acid soil that is high in organic matter for best growth and yield, but tolerates a broader range of soil types. Has moderate moisture needs. outdoor containers - Small-fruited and dwarf varieties are best, but all do well in containers. Requires fertile soil and a long, warm growing season. Relatively inconspicuous, curling down and hidden within foliage. not native to North America - Native to Asia. Large-fruited cultivars originated in India. Smaller-fruited varieties originated in China. bears ornamental fruit - In addition to the familiar deep purple, oval, glossy fruits, some varieties produce long, thin fruits or small, ball-shaped fruit. Other colors include white, green and orange. 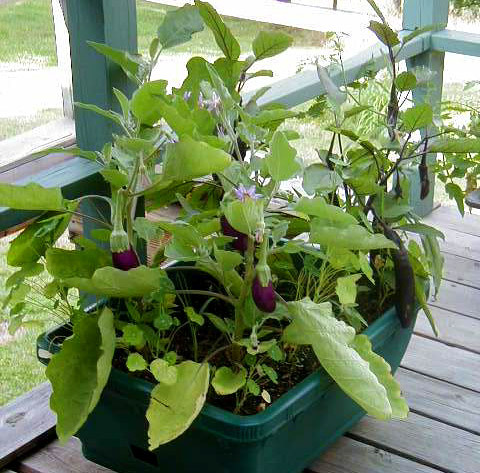 edible landscaping - Dramatic foliage and colorful fruit make eggplants a great vegetable to grow in flower gardens. Germination temperature: 60 F to 95 F - Germinates best between 80 F and 90 F.
Days to emergence: 7 to 10 - At 85 F.
Start inside about 6 weeks before last frost date (or about 8 weeks before expected transplanting). Plant 1/4 inch deep in flats or cell-type containers. Keep soil warm (about 80 F to 90 F if possible) until emergence. Eggplant will not germinate in cool soil. Harden off plants carefully before transplanting by reducing temperature and water. Wait until weather has settled, all chance of frost has passed and soil is in the 60s F before transplanting, perhaps 2 to 3 weeks after the average last frost date. Cool conditions can weaken plants. Frost will kill them. Consider using raised beds or black plastic mulch to warm soil and speed early-season growth. If using organic mulches to help retain moisture, do not apply until the soil has warmed. Set transplants 18 to 24 inches apart in rows 30 to 36 inches apart. Use row covers to protect plants from pests. If season is cool, fruit set may be inconsistent. Plants with heavy fruit set benefit from staking. Eggplants are heavy feeders, but avoid high-nitrogen fertilizers. They may encourage lush foliage growth at the expense of fruit. Pinch off blossoms 2 to 4 weeks before first expected frost so that plants channel energy into ripening existing fruit, not producing new ones. To help reduce disease, do not plant eggplants or other tomato-family crops in the same location more than once every three or four years. Flea beetles - Use row covers to help protect plants from early damage. Put in place at planting and remove before temperatures get too hot or plants start to flower. Colorado potato beetles - Handpick beetles, larvae and eggs. Cutworms - Use cardboard collars around transplants it cutworms are a problem. Verticillium wilt - Most serious disease of eggplant. Set into soil never planted to tomatoes, peppers, or strawberries. If you cannot, locate new plants in a part of the garden different from previous year's location, or plant in containers. 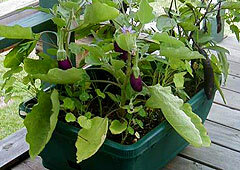 Browse eggplant varieties at our Vegetable Varieties for Gardeners website. Heat-loving eggplants may be difficult to grow successfully in cooler regions of the state. Look for short-season varieties that will fruit under cool New York conditions. Asian varieties are usually long and thin. Their skins are often thin enough that they don't need peeling.